Imprisoned in the famed Hotel Metropol, we meet the Russian Count Alexander Rostov. He has been sentenced to house arrest for having written an allegedly incendiary poem critical of the revolution, and at once finds his life of aristocratic luxury reduced to a small room atop the regal hotel. The Count, however, retains his affable charm and noble bearing, engaging with the various menagerie of guests who visit the hotel over the years. 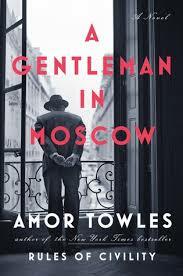 Amor Towles’ A Gentleman in Moscow is a lovely story of historical fiction with an elegance all its own.